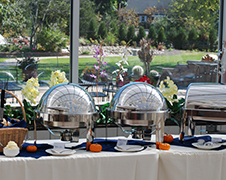 t first glance Farmington Gardens seems more like a setting from the pages of Frances Hodgson Burnett’s Secret Garden, than a modern reception facility complete with all the amenities necessary to fulfill even the most lavish ambitions of today’s bride. A closer look however reveals a small army of waiters, coordinators, chefs & designers primping, adjusting & fussing to assure every detail, every petal & every morsel of food is perfect. Sprawling trees line the circular drive, welcoming bride, groom & guests to the charming gardens that embrace this elegant, fully restored barn and original silo. The view through an ivy covered stone wall hints at the picturesque backgrounds adorned with a hand crafted white gazebo, small fish pond, brick patio & perfectly manicured lawns, all framed by a breathtaking view of rolling fields as the sun sets. Your guests are welcomed inside by large knotty Alder French doors. 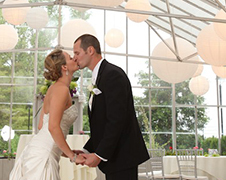 They may move into the Garden Room, an enclosed all glass greenhouse overlooking the beautiful outdoor surroundings and a perfect setting for your ceremony or cocktail hour. French doors open to the patio to enjoy the cool breeze, gaze at the stars or relax in the fresh air. The second set of French doors give way to the banquet room where our staff of planners, bartenders & black tie clad waiters cater to your every whim. Exposed wood beams and wrought iron chandeliers set the tone for a romantic evening. 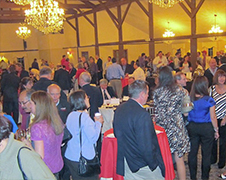 This family owned & operated event facility is one of the premiere wedding venues in New England. Let us make your special day as perfect as it deserves to be, surrounded by the natural beauty & rustic charm of Farmington Gardens. 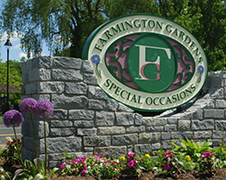 Farmington Gardens Promotional Video from Vivid Events on Vimeo.